Plus, how big of an impact can Virgil van Dijk have at Liverpool? Harry recently broke the record for most Premier League goals in a calendar year. THERE WAS PLENTY of hype about Harry Kane this week, after he broke the Premier League record for most goals in a calendar year, hitting his 37th, 38th and 39th goals of 2017 as Spurs swept aside Southampton on Tuesday. One of the more thoughtful responses to Kane’s goals was provided by Ireland and Leeds legend John Giles. 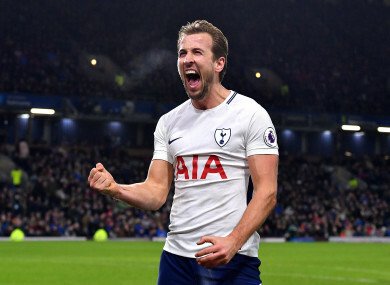 The veteran pundit was full of praise for Kane’s footballing abilities, but took exception to the manner in which the star’s achievement was being framed by others. Giles suggested that much of the talk of Kane’s feats was disrespectful to pre-Premier League footballers such as Jimmy Greaves and Dixie Dean, who actually scored more goals than the current Tottenham striker managed in a calendar year. “It’s part of the press and the television, they like to see records being beaten, which is fair enough,” Giles told Newstalk’s Off the Ball on Thursday night. “My only objection to it would be that these records we’re talking about only started from 1992 — that’s what happened with the Premier League and Sky television, they created a new game altogether. “It shows a lack of respect for the history of the game. “There was 100 years of history in the game before 1992, which has totally been wiped out. Sky will argue that it can be difficult to measure every single record in the history of the English game given the comparative lack of coverage and statistical analysis football was afforded in bygone eras, particularly in the late 19th and early 20th century. However, it is still easy to empathise with Giles’ view — surely, at the very least, the achievements of Greaves and others should be highlighted more frequently than is currently the case. The Premier League’s winter schedule is notoriously unforgiving. With the game faster than ever and greater levels of fitness and physicality required to compete at the highest level, it’s starting to seem increasingly unfair and detrimental to players, who are not allowed a break at any point during this time of year. “I’m not just saying about the privileged teams with six days to recover and to enjoy and to prepare for the next one, but also the ones with a little bit more (time) than us, for example, the ones that play after tomorrow — that extra day means a lot,” Jose Mourinho recently told Sky Sports News. Mourinho’s overriding point seemed to be that other sides were given preferential treatment to United in the fixture list, which is highly contentious, but there was truth in his suggestion that the December run of games take a particular toll on players’ bodies. With TV money and tradition dictating proceedings, the current situation is unlikely to be altered anytime soon. Consequently, the most successful sides over the next week or two will likely be the ones with the greatest squad depth and the ability to seamlessly integrate fringe players into their starting XI. Jurgen Klopp is one man who seems to have learned from the difficulties this hectic schedule caused Liverpool last season. Earlier this month, it was noted that the German boss had made 59 changes to his starting line-up in the Premier League this season — 20 more than any other side. Klopp was criticised for putting Philippe Coutinho and Roberto Firmino on the bench for the recent 1-1 draw with Everton, but perhaps it will prove a wise move in the long run. Last season, the Liverpool boss rotated players far less and as a result, a number of key individuals picked up injuries during the campaign, while the club’s winter form was especially dire. The Reds’ rivals should surely adopt a similar approach too — otherwise they will leave themselves especially at risk to player burnout and serious injuries long before the season has ended. Speaking on Sky Sports recently, former Liverpool player Jamie Carragher struck a chord with many viewers when he suggested the Premier League had become boring. “The Premier League now is becoming a bit of a joke league, with the top teams being so far ahead of the ones at the bottom. For those clubs, its almost like they are accepting they are going to lose the game, as long as it is only one or two-nil. Carragher’s comments are a tad harsh. In the past five seasons, four different sides have won England’s top flight — a scenario which is unthinkable in France, Spain, Italy and Germany, where one or two teams have generally been overwhelmingly dominant in recent years. Calling it a “joke” league on account of City’s terrific form for half a season seems a little premature. But there is certainly some truth in what the Liverpool legend has been saying — no amount of media hype can disguise the dullness of the current campaign. With a 15-point lead established at the top, Pep Guardiola’s men have the league all but wrapped up already. Therefore, a game like Arsenal v Chelsea, which would normally be a must-watch for Premier League fans and a highlight of football’s Christmas period, has suddenly lost much of its lustre. Both teams are essentially playing for a Champions League place, and even that is not quite the be all and end all it once was, with the significantly increased Premier League TV revenue rendering European qualification less essential for the top sides. 4. Can Rooney come back to haunt United? Both Everton and Wayne Rooney have undergone somewhat of a transformation recently. Earlier in the season, the Toffees looked set for a relegation battle, while Rooney’s form had been patchy since returning to Merseyside from Manchester United in the summer — to the extent that he was dropped at one point by caretaker boss David Unsworth. Nevertheless, under the guidance of new boss Sam Allardyce, both Everton and Rooney have looked rejuvenated in recent weeks, with the latter managing six goals in his last five matches, after just five goals in his first 19 games this season prior to then. Rooney has already faced Man United once in the campaign, and it was a forgettable occasion from his perspective — the Toffees were beaten 4-0, while the 32-year-old star was substituted on 82 minutes. However, when United come to Goodison Park on Sunday, you get the feeling it could be a very different story, with Everton enjoying a new lease of life and the Red Devils struggling for form, having failed to win their last three matches. 5. How big an impact will Van Dijk have at Liverpool? The transfer of Virgil van Dijk to Liverpool has proved a quite divisive issue. On the one hand, most people can agree that, at £75 million, the Reds seem to have paid over the odds for the former Celtic player. Yet the Dutch international’s ability and the extent to which he can improve Liverpool’s defence remain hotly debated topics. The 26-year-old, probably in part due to the uncertainty over his future, has looked unconvincing at times during the 12 Premier League appearances he has made for the Saints this season. Whether he is a success at Anfield remains to be seen. Other defenders, such as Dejan Lovren, have come to the club with good reputations but have struggled to live up to expectations, while pundits such as Carragher have argued that the Reds’ defence is inept owing to systematic failures that any one player cannot solve. It is hoped that Van Dijk’s leadership qualities will enhance a defence that often looks poorly organised, with the statistics showing that of all the top-seven teams, only Arsenal have conceded more goals than Jurgen Klopp’s side. At least one former coach believes he has the potential to be the world’s best defender, but there are still a number of Van Dijk skeptics out there, including Cardiff City manager Neil Warnock. “I think Sol Bamba is slightly better than Van Dijk, defensive-wise,” he said of Cardiff centre-back. Email “John Giles on Harry Kane's 'record' and more Premier League talking points”. Feedback on “John Giles on Harry Kane's 'record' and more Premier League talking points”.